Welcome to CitroExpert - the only independent quality magazine in the world on all Citroens - in Dutch. 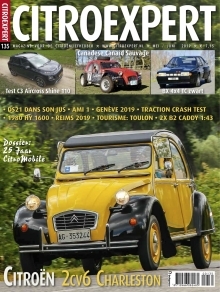 Since 1996, we have published a bi-monthly, 100 page glossy magazine containing articles that every Citroen-driver and -enthusiast alike, is eager to read. As well as the ever popular classic Citroën 2cv, DS and Traction-Avant, CitroExpert also reviews the latest models like the DS-line, sports cars, youngtimers, commercial vehicles, the rear-wheel drive classics, and of course the brand itself plus the people behind it – illustrated with hitherto unpublished pictures. Apart from that there are the fixed features on miniatures, books, tourism, clubs & meetings. For the time being, CitroExpert is only published in Dutch and distributed in The Netherlands and Belgium, but perhaps, one day...? However, despite the language, we do have world-wide subscribers from Japan to Iceland and from Moscow to San Francisco! If you would like to insert a free small ad (Citroën only please!) in the printed magazine, please register first, confirm the link in your mailbox, then click on the button ADVERTEREN. If you would like to contact the editor or publisher, please click on one of their names below.